Plumeria, pikake, gardenia — these fragrant tropical flowers seem to make people either swoon with joy or retreat to a cool, dark room with some extra-strength aspirin. The scents of these flowers are extravagant and are often described as: sultry, intoxicating, enticing, suffocating. I enjoy these flowers’ fragrances on the air, outdoors; in a greenhouse or in a bouquet, they can overwhelm me and even, up close, smell unpleasant. Since I would never wear a perfume that features these flowers (too feminine), I enjoy their opulent, creamy floral aromas in room sprays, candles and soaps. Mālie Kaua’i is a new company based on the "Garden Isle" of Kauai, Hawaii. 'Mālie' means "beautiful, calm water". The flowers and fruits used in Mālie Kaua’i’s products are water rich, and do not possess much essential oil. The company uses a high-tech distillation process (a patented vacuum technique using high pressure but low temperature) that preserves the "integrity" of the plant aromas it gathers. The end result of this process is called a hydrosol. Hydrosols (floral or fruit waters) are the fluids that course thru a plant, and, being mostly water, are easier on the skin than essential oils. Each batch of Mālie Kaua’i Hawaiian Hydrosols is unique to a particular flower or fruit harvest. Mālie Kaua’i claims its Hawaiian Hydrosols are the only "…natural hydrosols of gardenia, plumeria, pikake and pineapple". I look forward to trying the gardenia scent to test this claim; I have never found a "gardenia-scented" perfume, body or home product that comes close to the natural fragrance of the flower. 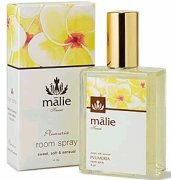 Mālie Kaua’i’s Plumeria Room Spray (4 oz/$28) is strong and linear — you get heady plumeria scent with its dash of citrus peel and sugar. Don’t let the terms "flower water" and "hydrosol" fool you — Mālie Kaua’i ’s room sprays are not light, watery concoctions. The room spray scents are powerful and will linger for a day or more if they are absorbed into fabrics. Sprayed on skin, Plumeria has excellent lasting power and it does smell natural, like a real flower. On its website, Mālie Kaua’i says the scent of plumeria "…aligns the astral and mental bodies bringing forth feelings of empowerment and confidence". It also states that hydrosols "effectively promote metabolic activity, including synthesis, stimulation and regeneration". These are understatements. When I spray Mālie Kaua’i Plumeria Room Spray, the veins in my neck pop out and I feel like I could easily paint my house, write a novel and cook a Thai curry with 50 ingredients — all in one afternoon. In other words, the scent gets on my "nerves" and sends me into talking sprees and activity spurts. Visit the Mālie Kaua’i website to purchase its products.